Santa Clause finally visited us on Saturday 1st February. Osian Llyr, Isabella Nicole and Martha Grave left him a mug of Milk and a Chocolate Maltezer cake, not forgetting a Carrot for Rudolph. Our day began at 6:45am - when Martha's NG tube got caught in our duvet and Mark had to take her to our local hospital to get a new one put in. While he was there, Osh woke up - the only way I could stop him going downstairs was by letting him come in to our bed for Christmas Cuddles just the two of us; he is such a Mammi's boy that he happily obliged. she woke up, but it was a very short snooze and pretty soon she came running in to our room and jumped on the bed. It was time to check if Santa had been. We work hard and save throughout the year. Seeing your children's face on Christmas morning when they see piles of presents waiting for them is priceless, it's something you cannot appreciate until you have children of your own. 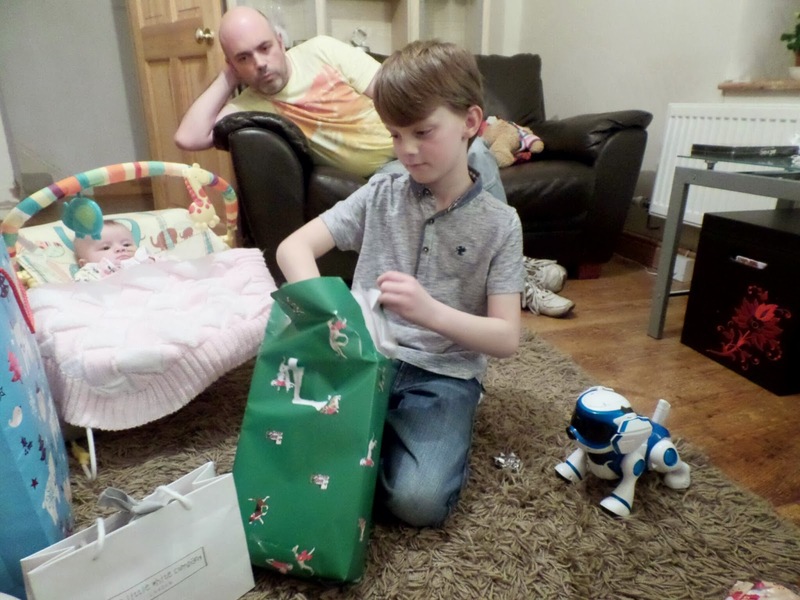 The presents were ripped open at record speed, our living room was a chaos of discarded wrapping paper and plastic packaging - just the way I had hoped it would be. The kids wanted all of their new toys opened there and then, so exited they wanted everything opened at once - they didn't know what to play with first. We were due to be at my Mam's for 2pm for our Christmas Dinner, the kids all wearing brand new clothes - Martha decides to chew on her freakishly long fingers to the point where she gags...and vomits!!! All over a brand new dress I had been so exited for her to wear. She smiles at me ever so sweetly as I get her washed and in to clean clothes - I on the other hand could have cried. Mam did a great job, the food was superb. Afterwards it was time to open gifts from friends. We are so lucky that even after the support they've given us through Martha's treatment - our friends still went to the trouble of getting us all presents aswell. I don't know how the kids had the energy, because after gorging on Christmas Dinner all I wanted to do afterwards was fall asleep on the sofa - I'm the same every Christmas. But this year it was different, it was a contentedness. I am home, Martha is home, we are all home together, the kids are happy and we are happy. In all honesty - that is all I could ask for. That is what Christmas is all about - Family.